Photo measuring 4.5 x 2.6 inches. Remnants of album mounts are still stuck in the corners. As with so many of these unidentified photos taken out of context, this one leaves much to the imagination. Who are these people? Are they friends? Relatives? Lovers? Some combination? Where are they? Who is taking the picture? I actually think I have another photo of at least some of these people, but I didn’t set it aside because they are in shadow and it’s hard to see them, or some such reason. Maybe I’ll have to look for it again. But it doesn’t give me any better idea of who they are. Regardless, here we have a nice moment with fun-looking people, captured for us to enjoy a lifetime later. This photo should have been taken in early 1920’s judging from both men and women clothes and hairstyles. I agree. Unless it has an actual date on it, then I don’t want to commit to anything too firm in my description, but I agree the clothes look right for that period, plus the look and feel of the paper, the style of album mounts, etc. Thanks for the information! I know it isn’t, but there is something of a silent movie still about this photo – or a behind the scenes shot around a movie studio. They look to be dressed-up as different character types. I think I am imagining it that way due to the first guy’s badly fitted jacket. It looks several sizes too small. It is a very neatly composed picture, isn’t it. I really love this one!! Great comment! That hadn’t occurred to me, but I see what you mean. It’s the period of the clothes, of course, plus the way they somehow look like off-duty performers, a certain vivacious energy to them. 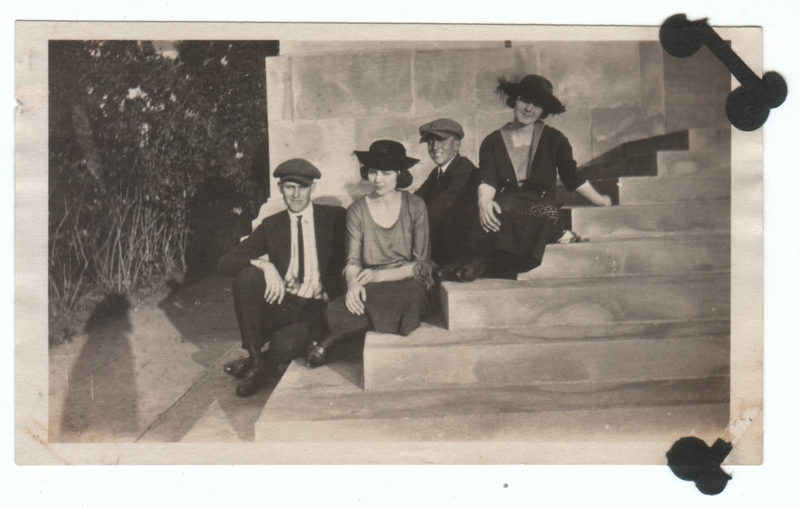 Plus, since silent movie makers sometimes just took their cameras and actors out into the surrounding town and shot in real locations, sometimes without bothering to get permission, it makes sense that these might be four actors waiting for their scene on the steps of a bank or school building, capturing the last bright light of the day. I mean, I assume that’s not what’s actually going on here, but it’s plausible. I agree that isn’t what is going on but glad you like the theory. Yes! That is why they are so much fun.